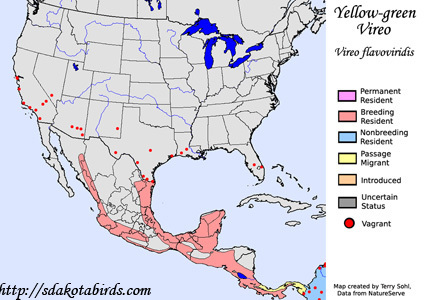 The Yellow-green Vireo is only a rare visitor to the United States, where they have most often been sighted in southern Texas. Their natural range covers much of Mexico and Central America. They are close relatives of the Red-eyed Vireo, a species common in the United States, and were once considered the same species. However, they were split into two species, and can be told apart by geographic range, as well as slight differences in songs and plumage. Habitat: Found in a variety of open woodlands, including both mature forest and second-growth forest. Diet: Feeds on insects and spiders at all seasons, but will also sometimes eat fruits and berries, and less often seeds. Behavior: Forages by moving among the foliage of trees and shrubs, searching for insects. They will sometimes hover while gleaning insects from the foliage. Nesting: The nest of a Yellow-green Vireo is a cup of grasses, bark fibers, other plant material, and spider webs, placed in the fork of a small branch. The female lays 2 or 3 eggs, and she alone incubates them. When the eggs hatch, both parents help raise and feed the young. The young leave the nest after about 2 weeks. Song: The song of a Yellow-green Vireo is a series of whistled phrases. Migration: Strongly migratory, with birds that breed in summer in Mexico and Central America moving to South America for the winter. Conservation Status: Populations are found over a wide geographic area, and they are still relatively common in parts of their range. 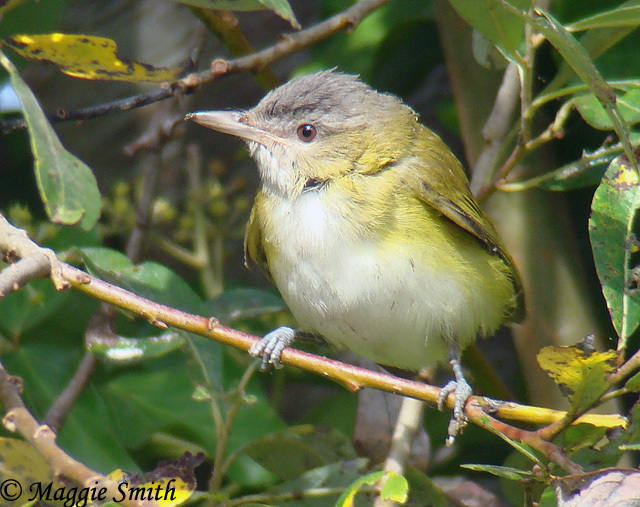 The Yellow-green Vireo is considered a species of "Least Concern" by the IUCN. Photo Information: Photo taken by Maggie Smith - October 5th, 2010 - San Luis Obispo County, California - Photo licensed under Creative Commons Attribution NonCommercial 2.0 Generic License.